But he reminds us that it’s not just disheartening. He writes, “It’s also costly. Your social media marketing can’t pay off if your audience isn’t getting excited about what you have to say.” So how are brands – specifically financial services brands – earning engagement? And what, exactly, is the payoff? We took a look at the Facebook, Twitter and Instagram profiles of some top banks to see what kinds of posts financial brand followers and likers find most engaging. The takeaway is clear: the topics that motivate social media engagement vary by brand and by platform. Each brand is doing its own thing. This means that financial institutions are figuring out how branding translates to social media. It also means they’re learning what it is about their brand story that most resonates with their particular segment of social media users. Bigger than a bread box? There are other kinds of payoffs. First, in the algorithms of platforms like Facebook post engagement can determine whether or not your content appears in News Feed at all. Second, social media engagement has the potential to nurture connections with consumers, which is important for both branding and customer relationships. This payoff is harder to quantify, of course, and while its impact may not break any records, it does have value and has a role to play in financial services marketing strategies. So what are brands up to? 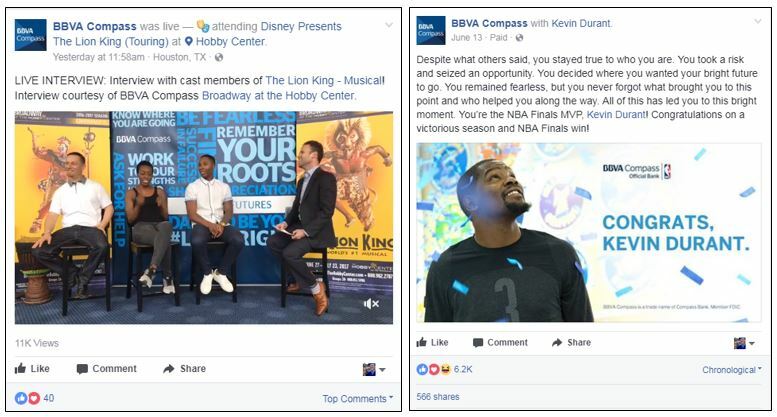 The financial brand posts that are earning engagement seem to match what Kasteler outlines for Marketing Land: “To get your audience commenting, liking, sharing and clicking on your posts, you need to entertain them, inspire a reaction and spark intrigue.” And each of these brands has a different path to achieving that. Hopefully, seeing what they’re doing will help you identify your own brand’s sweet spot. 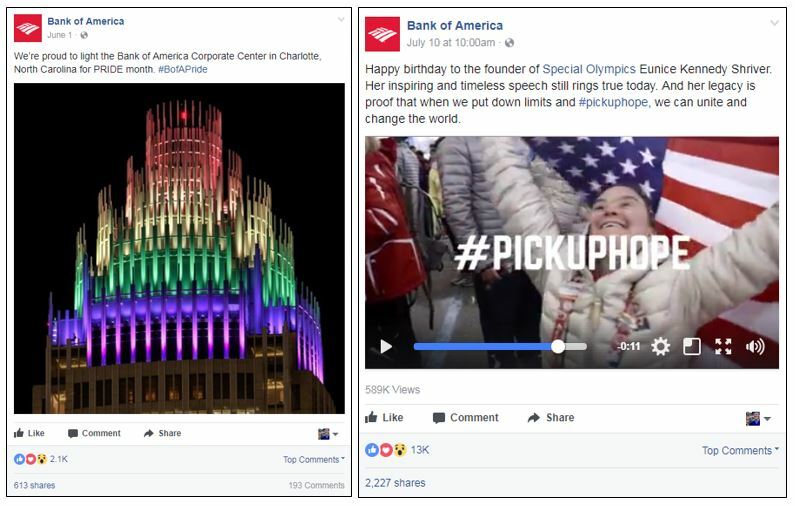 Bank of America uses Facebook to promote special lighting of its Corporate Center in Charlotte, North Carolina, and each time it does (during PRIDE Month, for example), the posts earn more engagement than the brand’s average posts. 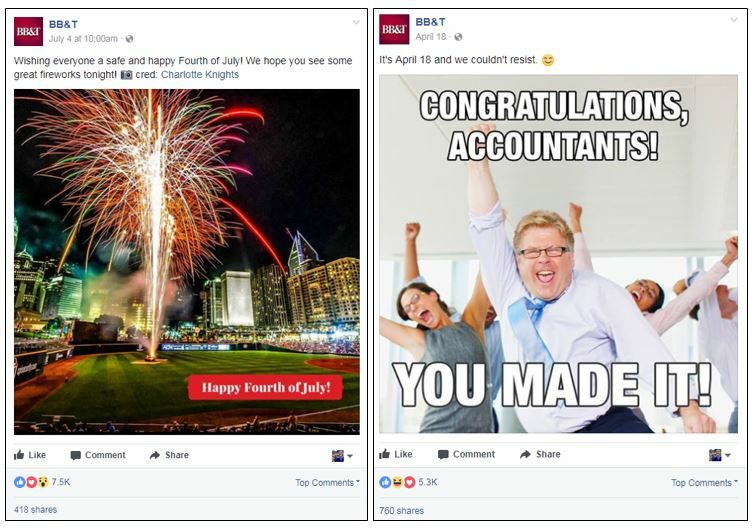 By far, however, Bank of America’s most engaging posts are videos, like those related to Special Olympics and the Boston Red Sox. It even earned more interactions than the New Yorker on its share of the magazine’s own 360 video exploring Shanghai via motorbike. 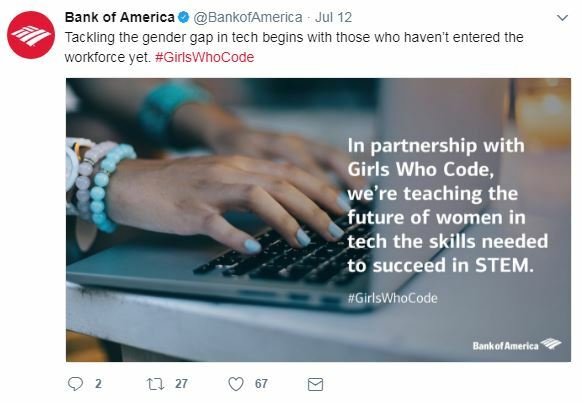 A similar approach (video, sports partnerships) works for Bank of America on Twitter, where it also has some success with content related to its volunteer and advocacy efforts. While pics of its Corporate Center light shows are popular on Bank of America’s Instagram, video is the way for the brand to go here, as well, from fireworks to Pride Month… and even going back a few months to a #BetterMoneyHabits video series featuring money origami. For BB&T Bank on Facebook, travel tips (like this one) and money tips (like this one) earn higher-than-normal engagement for the brand. However, what’s most popular with BB&T fans is holidays. Here’s a list of the brand’s most recent celebratory posts: July 4 (with a nod to baseball), Father’s Day, Mother’s Day, May the 4th (Star Wars Day), the end of tax season, Siblings Day and St. Patrick’s Day. The same Kevin Durant post on Instagram (where the confetti image was a video instead) was one of the brand’s most engaging posts on that platform. Say what? Product promotion is engaging? Really? Hear us out. Like other brands, Discover can struggle for social engagement. And, like other brands, product and service promotions on its Facebook page often fall flat. 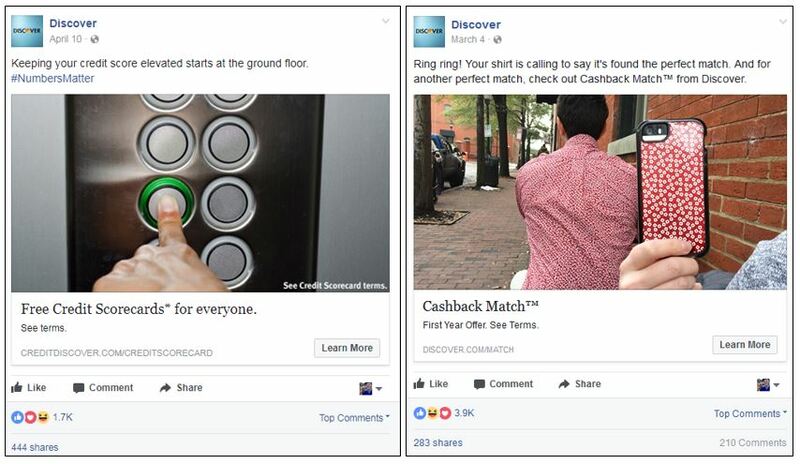 However, some of Discover’s most engaging posts are about product offerings and features, like free credit scores (also popular on Twitter), automatic bill pay, the credit card grace period and the Cashback Match. What these engagement spikes are likely to provide the brand is intel about which offerings are most exciting to consumers. 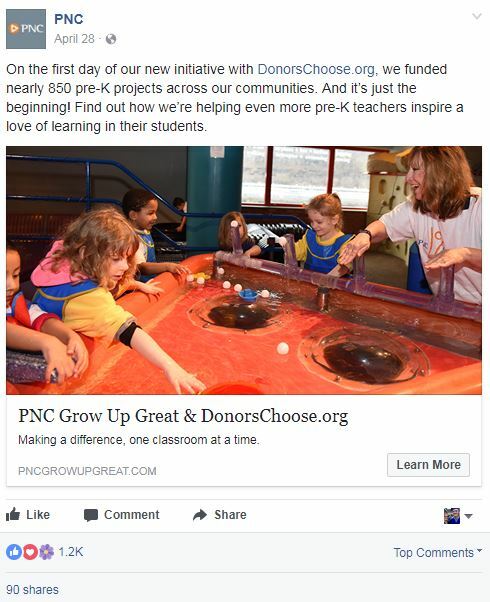 PNC doesn’t publish content on its Facebook timeline very frequently, but when it does, posts promoting the brand’s charitable giving earn the most engagement. From Simple’s Facebook page, we learn that the brand’s fans engage with it based on what it’s most known for: customer service/staff who are hip, chatty and attentive, plus “goals,” the feature of its app that helps customers budget and save. First, the chatty: its most engaging post in recent months asked, “If you were handed $1,000,000 right now, what’s the first thing you would do with it?” What happened was really unique: the highest level of engagement didn’t come from reactions; it came from comments… over 1,000 of them. And of course, Simple participated in the conversation, replying to each person with encouragement, humor and GIFs. Second, the goals: the brand earned high engagement when it asked customers what “awesome” things they’d saved for. The conversation was designed for Instagram, but played out on Facebook, too. What have you done to save a lil moola? 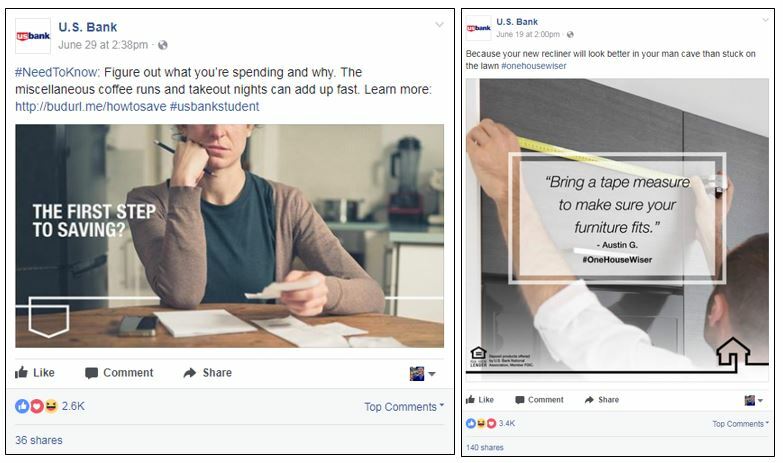 Posts with advice and tips earn the highest engagement for U.S. Bank on its Facebook page. Some of the advice comes from the brand (as with the #NeedToKnow campaign; see examples here and here); other advice is user-generated (as with the #OneHouseWiser campaign; see examples here and here). Although U.S. Bank shares this same advice on its Twitter page, it earns little engagement there. Only two kinds of tweets seem work for the brand on Twitter: promotion of volunteer efforts and student programs. The #OneHouseWiser campaign struggled on the brand’s Instagram account, as well. What works for U.S. Bank here? Instagram-esque photography, posts on volunteer efforts and student programs (just like on Twitter) and video, including a series on tax facts. This survey of financial brands’ social media engagement isn’t intended to be scientific. Instead, our observations are intended to be a collection of highlights that answers the question: What stands out* for each brand when it comes to social media engagement? Set realistic expectations. / Social content and social engagement ought to be part of your strategy for reasons that have nothing to do with “going viral.” Understand what you will – or will not – gain apart from crowd size. Experiment. / Try new things to find what resonates with your audience on each platform. This refers not only to topics but also to format (images? videos?) and tone. Think broadly. / When framed properly, even brick and mortar (as in the Bank of America Corporate Center lights) and product features (as with the Discover examples) can excite. Get moving. / Video is currently the most engaging form of social content. How can you use it to educate or entertain? Be yourself. / Don’t assume you can pull off the same thing as other brands. Just like with other types of marketing, your voice – i.e. authenticity – matters. Let collections of posts like this one inspire you, but publish content that stays true to your brand. Pick up the (reality) check. / If you want your content to be seen, it’s necessary to put a budget behind your social media posts. Only one post in this collection is identified as “paid.” However, that label disappears once a brand stops boosting the content. It’s safe to assume others in this collection were also sponsored for a period of time. Even if that’s the case, good, engaging content still matters. Paid social is an important and necessary part of a brand’s strategy, but it only makes sense to sponsor quality content. * As we considered posts, we selected posts that were engaging largely due to positive responses. In other words, we selected posts that attracted the kind of engagement you’d actually want. Recent Twitter changes present significant opportunities for both brands and consumers. The latest round of updates offer more room for expression, tidier conversations and simplified communication. Millennials understand that branded content is still marketing, but if anything can bridge that trust gap, this readers-first, consumers-second approach from Chase and theSkimm stands a really good chance. 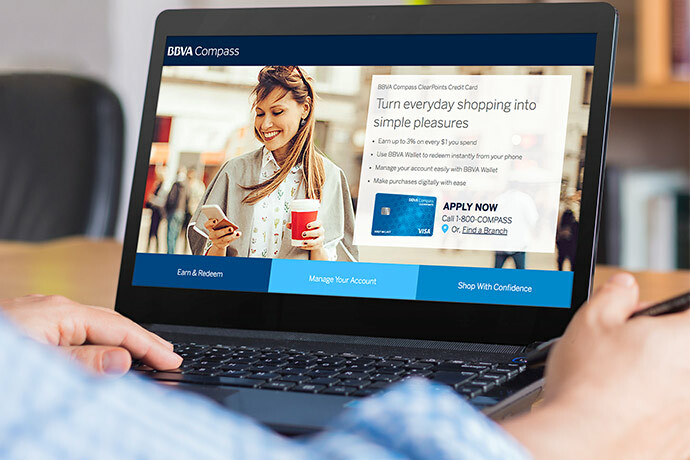 Cash back card sets the stage for success. 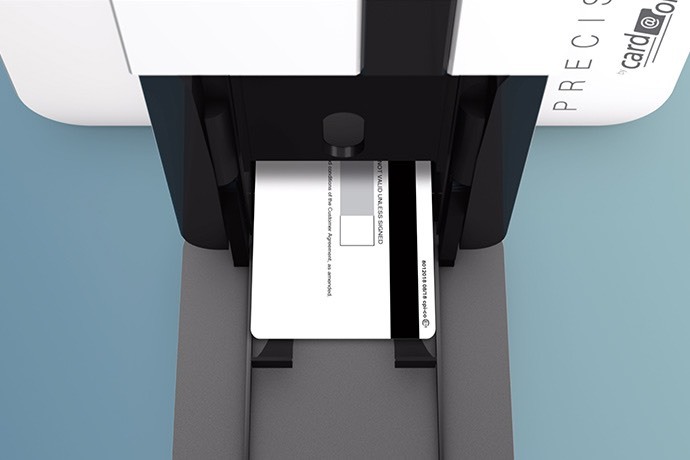 CPI’s Card@Once is an instant issuance solution that allows financial institutions (and others) to physically print EMV and dual interface (magnetic stripe/chip and contactless) debit and credit cards on demand – providing customers with a finished, activated card in under two minutes.